This looks like a good one. I'll keep searching for more information. 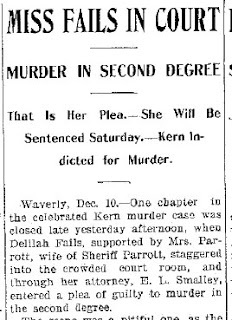 That is her Plea.—She Will Be Sentenced Saturday.—Kern Indicted for Murder. 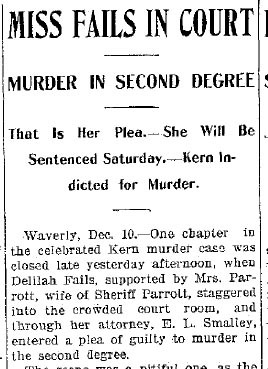 Waverly, Dec. 10.— One chapter in the celebrated Kern murder case was closed late yesterday afternoon, when Delilah Fails, supported by Mrs. Parrot, wife of Sheriff Parrott, staggered into the crowded court room, and through her attorney, E. L. Smalley, entered a plea of guilty to murder in the second degree. The scene was a pitiful one, as the nerves of the self-confessed murderess had completely forsaken her, and it was only by use of stimulants that she was enabled to pass through the ordeal. 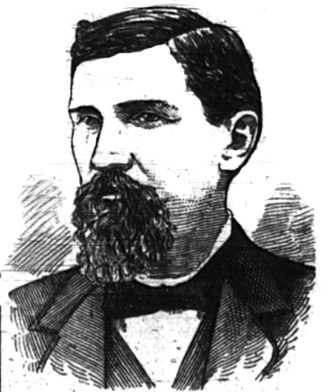 Four times during the afternoon prior to being brought into court she had swooned, and each time was with difficulty restored to consciousness. When she did make her appearance, her face was badly swollen with constant weeping and had lost he indifferent look which had hitherto characterized it. After hearing the plea, Judge Clyde set Saturday morning as the time for passing sentence. It is generally believed here now she will receive the extreme penalty, imprisonment in the penitentiary for life. She says she expects no less and will be glad to have the matter settled. All day her attorney has pleaded with her to stand trial and trust to sympathy from the jury, but she said she knew she was guilty and wanted to be relived from suspense. From her condition now, it is not believed that she could stand the ordeal of a long trial. An indictment against William Kern was returned by the grand jury late last evening. It charges murder in the first degree. 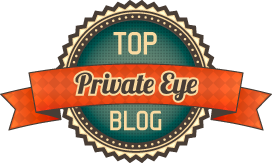 It leaked out last evening that the grand jury had another sensation in hand; that Delilah had incriminated another party in in the neighborhood in her confession, this not being made public before. This party has fled the country and the efforts of officers to locate him have been without avail. Delilah’s plea seems to be satisfactory to the people here, and no attempt at violence is now feared, though ample precautions have been taken. Wow, that's great. Now I definitely have to do major post on Miss Fails.